I looked at a lot of different pictures of nurseries online and took bits and pieces from some that I liked and then simply searched for things I had in mind to come up with my Delicate Girly Nursery Theme. What brand and color of paint did you use? Sherwin Williams Light French Gray. If you added stripes, polka dots or other paint effects, tell us how you did it. 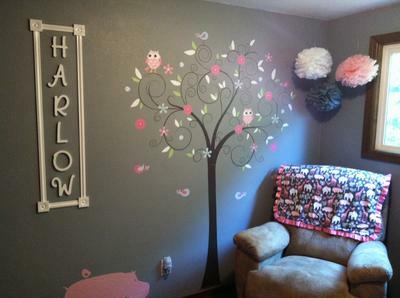 The tree, hippo and saying are all decals that we bought and put on the wall. What brand of crib did you buy? Where from? Sorelle Princeton Cherry 4-in-1 Convertible Crib Changer from Babies R us. What brand of furniture did you choose? Where did you buy it? Lazy Boy recliner, Walmart night stand. What bedding set did you use? Where did you buy it? A plain pink crib sheet from Babies R us, the light purple polka dot hippo blanket is from Amazon.com, the pink moose quilt hanging over the crib is handmade by a woman at a Farmer's Market in Hamilton, MT, and the small gray and pink blanket with animals and pink ruffle over the lazy boy was handmade by "Mywoobyandme" on Etsy. Tell us about your window treatments, lighting, rugs, wall decor and accessories. Where did you buy them - were any handmade? on Etsy, the wall flowers, hippo night light and Pom Poms above the recliner were bought on Amazon.com. The rug is from Walmart and the wall decals came from Etsy. The Harlow sign was handmade by my husband and I. We bought the letters from Michael's Craft Store and the frame was made from moulding from Lowe's, all painted white and mounted with double sided padded tape. 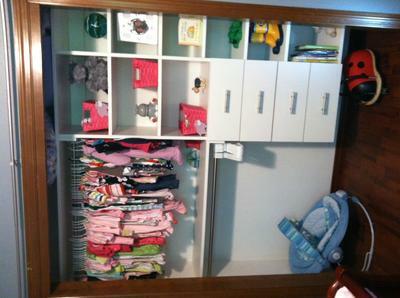 How did you store all your baby goodies? In baskets, on shelves? My husband built the closet system from scratch. The pink baskets were bought at Lowe's and store all the little things like hair accessories, socks, mittens, hats, etc. Books and knick knacks were purchased on Amazon.com and received as gifts. How long did it take you? Was it easy, fun, difficult? What was your favorite part? I started right away ( a little excited and overzealous) but it only took about a month to gather everything and put it into it's place! 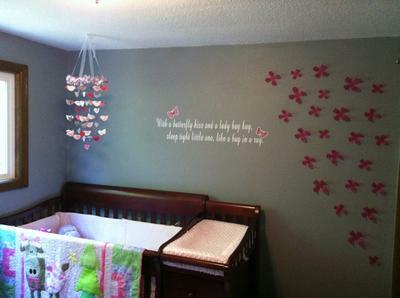 Did you do the entire nursery on your own or did someone help you? Who? What did they do? My husband helped with the lifting, building, hanging but I did the decorating. 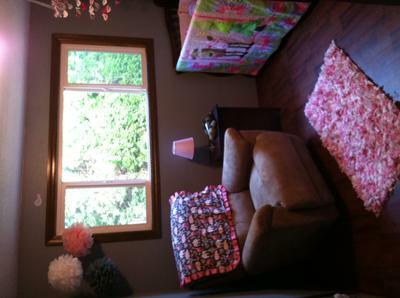 What do you love most about your little one's finished room? It is extremely quiet, peaceful and comfortable. I sit in there frequently just to relax and envision her arrival!